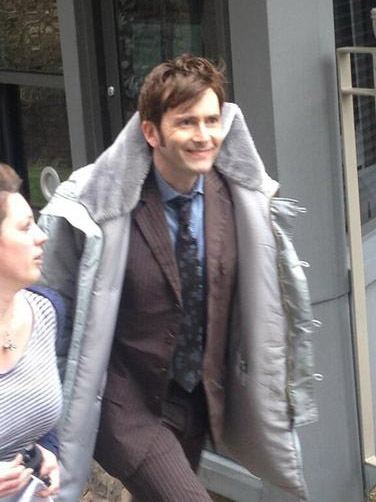 Tennant cosplayers are a canny bunch. 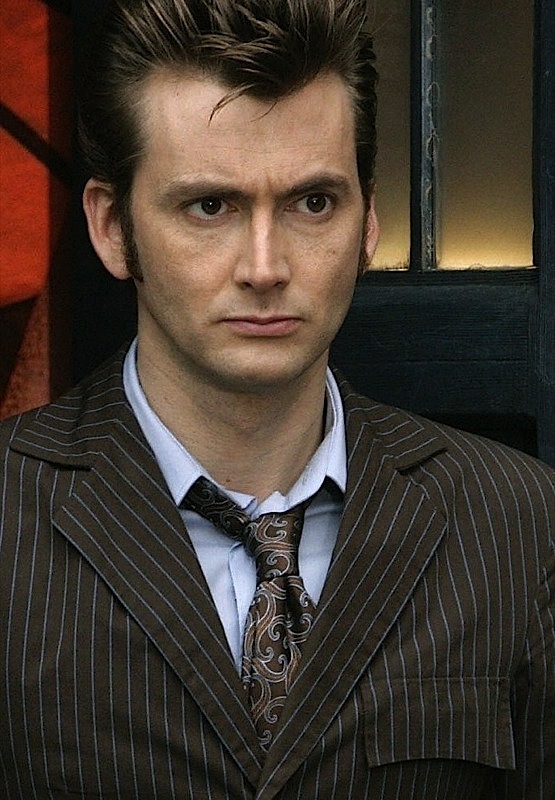 The Tenth Doctor’s costume can be blocked in very easily with a brown suit and a pair of readily available Converses. But the one thing they crave are the ties - screen accurate if possible - if not then a good replica. Not all the ties have been rewoven, and even fewer originals come up on eBay, so if there’s a third way the Ten cosplayer will find it! Well one of my readers, Simon Richards, has done just that by making his own copy of his favourite tie - the Thomas Nash tie worn in The Idiot’s Lantern. Here’s how he went about making it. The Idiot’s Lantern... great episode, great scooter, great clothes, great tie and great shades of Elvis. With lots of humour, anger and emotion this Tenth Doctor episode is easily one my favourites. I have been a Tenth Doctor cosplayer for a good few years and whilst my collection of costume pieces increases, The Idiot’s Lantern tie has always intrigued me. The main problem was always not knowing what the tie actually looked like. 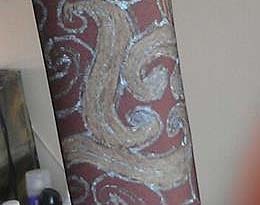 During the episode it is very tricky to identify the whole pattern. 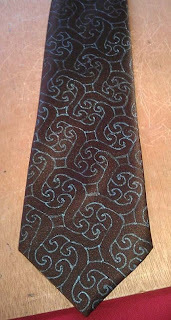 Thanks to Steve’s Tie Index this tie, for me, became a little more obtainable. I had tried to look for the original screen accurate tie by Thomas Nash but soon realised this was going to be a very long, expensive route to go down. I decided, therefore, to make my own version. Using reference images from the Tie Index blog, screen captures and of course every cosplayer’s favourite tool... Google, I took the time to collect as many high quality photos I could. 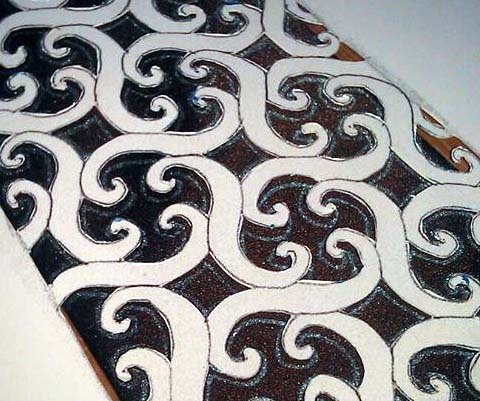 I chose to use one which showed the pattern up close in detail. 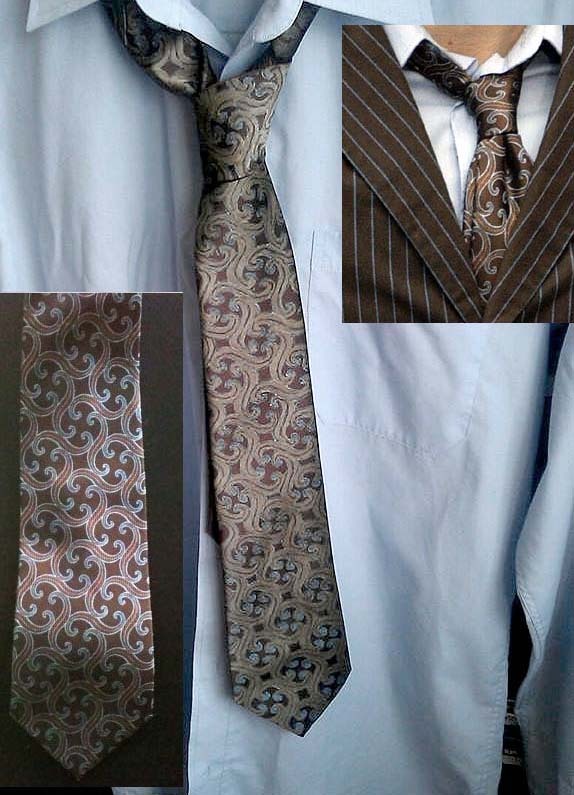 I measured one of my other ties for size and adjusted the image to the correct scale. This meant that when I printed the image at 100% it would hopefully map out exactly the correct size of the tie. 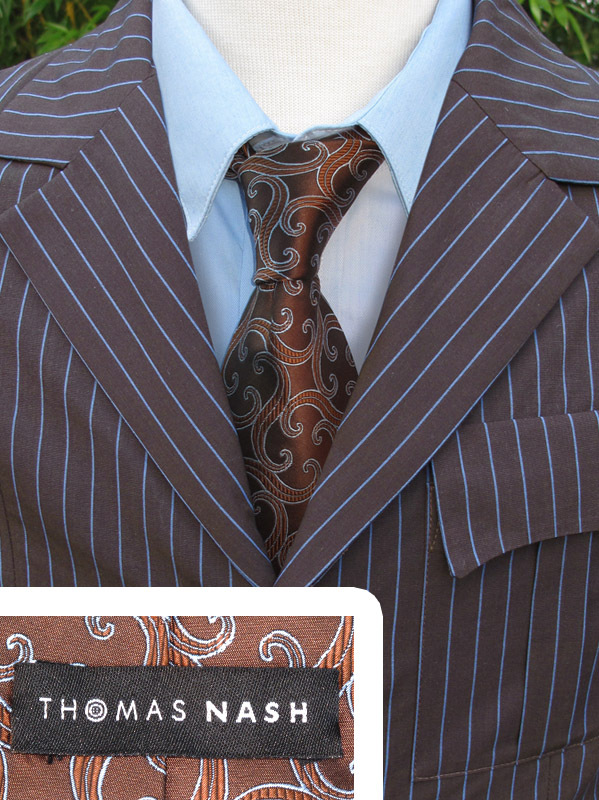 The hard part here was continuing the pattern in full because all reference images do not show the full length. I decided to trace from the print out onto some paper using my window for a light box. I taped the pages together and then traced around my existing tie to get a rough outline. 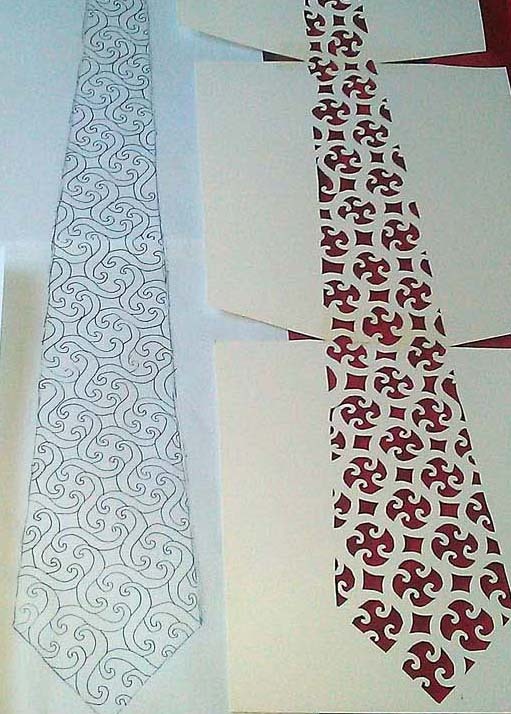 From this point I needed to create a template so I could transfer the pattern onto the tie itself. Using my pattern on paper I scanned the images onto my laptop and bought some plain card. Printed the images again at 100% and then attached the card together like before. Using a board and a scalpel I carefully cut out the design allowing me to see the pattern in full. From this point I pretty much had my tie all planned out so I went ahead and bought a plain brown satin tie, metallic gold and metallic blue ink pens. 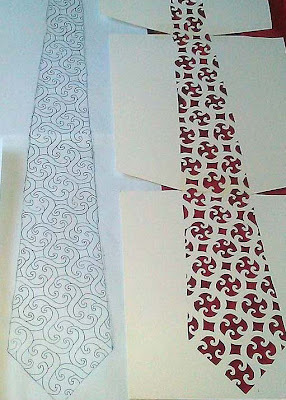 Once my tie arrived I set to work attaching the template over the tie to hold it steady as I began tracing out the pattern markings. The outcome looked rather amusing and a little Gallifreyan. My next step was a little frustrating as it involved filling in the lines between the design to fill out the S shapes. Once this had been completed the tie became very Idiot’s Lantern. 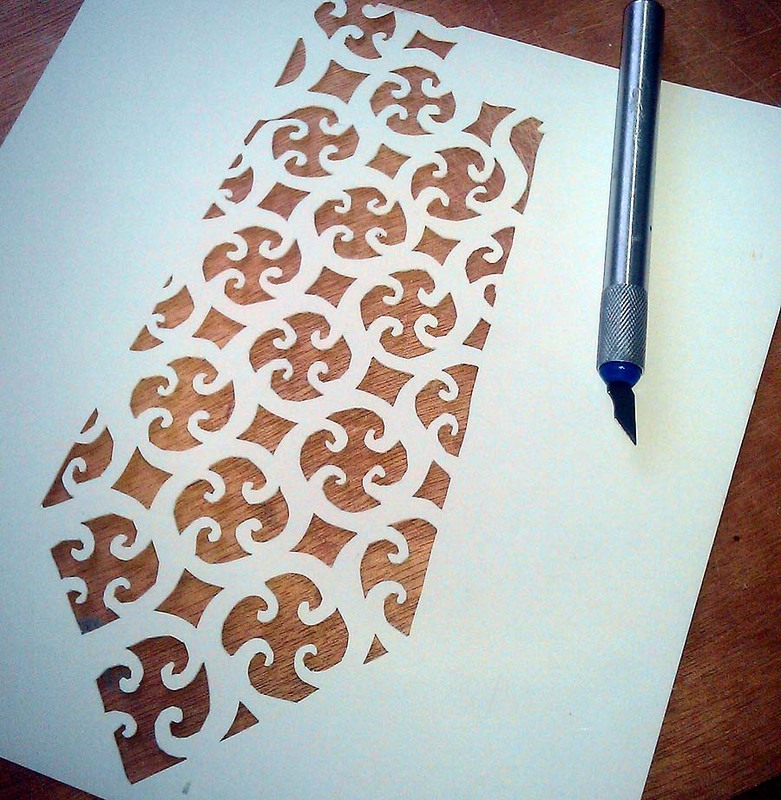 Using the gold metallic ink pen I bought I then began to fill in the S shapes to bring the pattern to life. I was quite worried that it looked slightly messy but as I continued and eventually put in a blue line through each S shape the tie took shape rather nicely. It may not be 100% accurate or very tidy but this was a fantastic little project to work on and I’m very happy with the outcome! 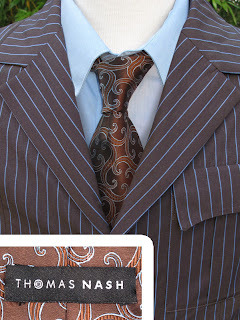 Have you made yourself a tie in the same way - using a blank tie and fabric pens? and we can look at getting you in my blog! So this will be my little rant, effectively about supply and demand. I’m finding the latest developments about the St George by Duffer tie worn by David Tennant in the upcoming 50th Anniversary Special to be more than a tad interesting. Between 2006 and 2009 when David was flying high in the role, the rise of the cosplayer dressed in a brown suit and long trench coat became a convention sight more common than not. But for some reason the ties worn were not in their crosshairs until after he had departed the role. 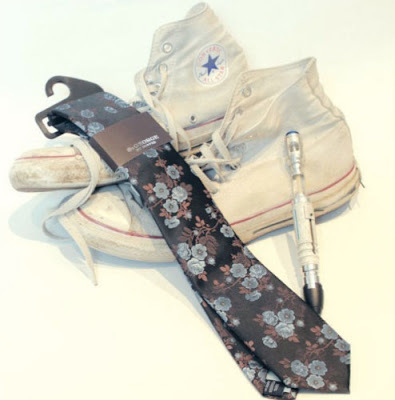 The turning point was the 2010 Bonhams Doctor Who Auction where a small but nonetheless significant lot of Tenth Doctor ties were sold. They were significant not for being made available, but for the sheer fact the accompanying text listed the labels, blowing the lid on the manufacturers we should be looking out for - Daniel Hechter, Rocha John Rocha, St George by Duffer and Thomas Nash. Pandora’s box was opened and the fan-machine that was in place following Matt Smith’s costume (the Paul Smith shirt; TopMan trousers; All Saints boots; G-Star RAW trousers etc etc) soon was on the case. 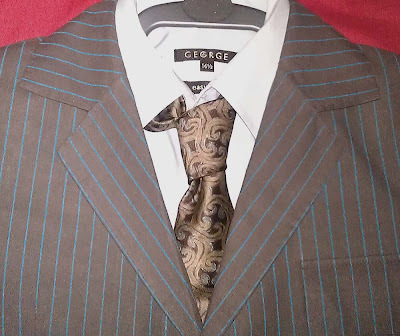 Even today, original St George ties as seen in Utopia crop up on eBay. Previously gaining over £200 a piece, they have more recently gone for a less eye-watering £50 as this listing demonstrates. 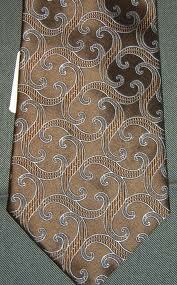 Brown background colour with diagonal floral pattern. This tie was a gift from a friend a fellow doctor who collector to my husband. tie is in excellent condition but has no label on the back. Seen in the episodes Utopia , The last of the time lords and The sound of drums. This is not the anniversary tie , one sold for over £225 on ebay. Fast forward to this year, and within a day of filming with David Tennant on set for the Special, the new tie was spotted; identified; ordered and if lucky, bought in-store at Debenhams branches across the UK. 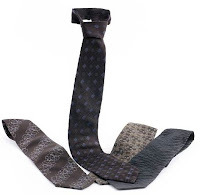 Before the end of the week, photos were on forums, Twitter and Facebook showing off proudly found ties. Variants were spotted; widths were analysed; alignments of patterns were scrutinised, all endlessly debated on the forums. But as fast as they were appearing on forums a similar number were popping up for sale on eBay, and for prices more associated with the rarer originals from 2006 to 2009. To show just how numerous they were, here is just a selection of seller’s images from their listings. Where previously the ties were identified after the fact - we now have a tie which is still available in-store. As a result most cosplayers who want one can get one either by walking into a branch of Debenhams or buy one from eBay. Admittedly these are often at double their street-price, but that is still below the average price of the rewoven replicas found on the net. Quite why you’d buy a replica of this tie when originals are so prolific I don’t know. 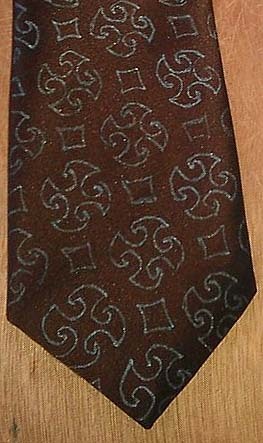 Anyway, to stand out in a crowded marketplace, I’ve noticed a number of eBay sellers coming up with novel ways to display their ties. Some on mannequins with Tennant suits; one even playing on the British heritage of the show by using a Union Jack as a background. But if there was a prize, I would give it to the listing that used the photo below. Very creative!